Success. Teamwork. Growth. These are all terms business owners think about, dream about, and envision for their companies. Your best chance at achieving success, teamwork and growth for your business begins with having a solid team that exemplifies your guiding principles. The Entrepreneurial Operating System™refers to these guiding principles as your Core Values. The success of your business depends on how well your employees understand and practice them. If your employees don’t truly believe in what your business stands for, they will drag you down and prevent your organization from growing and accomplishing its goals. In my previous blog post, “Do You Have the Right People,” I discuss the importance of finding the right employees for your organization. I introduce The People Analyzer Tool and explain how it assists in determining each employee’s commitment to your Core Values. Finding the right people is an important first step. And the second step, ensuring you have the right people in the “right seats,” is equally important. You must have right people and right seats. What does the “Right Seat” mean? In EOS terminology, the “right seat” refers to the role or accountabilities of each position, or seat as we call them in EOS, in your organization. You should identify the types of seats your business needs, and have a clear definition of each role. Once you’ve established your seats, and you’ve identified that you have the right people who exhibit your core values, it’s time to see if you have a match. You will look at each employee to figure out if you have the right person in the right seat. By referring to The People Analyzer Tool, you’ll be able make this determination based on each employees’ GWC. EOS uses “GWC” to determine if you have the right people in the right seat. It stands for Get it, Want it, and Capacity to do it. The right people for your organization are those that share your vision, understand your Core Values and get it, want it and have the capacity to do the job. Here is further clarification of the GWC model. Get it – An employee truly understands the job role. He or she knows what is expected, comprehends your culture, and is in line with your company’s Vision and Core Values. This is an employee that truly “gets it”. Want it – An employee who wants to work with you. He or she is interested, has the desire, and is motivated by your core values to do the job to the best of his or her ability. This employee wants to make a difference. Capacity to do it – The employee must have the knowledge, experience or education to be able to do the job. He or she must be willing to put in the time, and have the physical, emotional and mental capabilities necessary. Some employees can be trained to improve his or her capacity. Others cannot. If you answer “no” to any of the GWCs, you don’t have the right person in the right seat of your organization. You may be able to change a “no” to a “yes” if that person is willing and you can invest the time in training, but sometimes you cannot. This may require you to look at other seat options for that person, to ensure a better fit for your organization. When you have the right person in the right seat, you’ll know it, and it produces wonderful results. A great example is the receptionist at my last company. She had the uncanny ability to recognize a person by their voice after the first time she spoke with them. From that point on, she greeted everyone by name when they called our office. When the caller said, “Good morning,” she would jump in with a sincere “Good morning, Mr. Jackson, how nice to hear from you.” Her attitude and skill exemplified our Core Value to “Value our Reputation” many times daily. Our visitors loved it and she positioned them for a great experience with our company. She “got” her seat, wanted to do it, and was extremely capable. 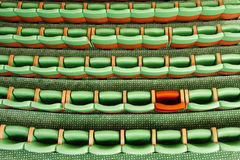 If you need help determining if you have the right people in the right seats of your organization, contact us. We can help.